What is the Acoustic Enclosure? 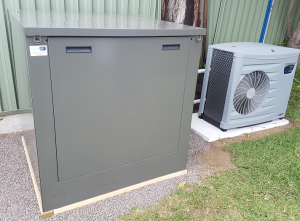 The Acoustic Box Company specialises in manufacturing soundproof boxes, specifically for enclosing swimming pool equipment. We supply and deliver to all areas in Australia. Our Boxes have a unique state-of-the art design which requires less than 5 minutes to assemble and without any special tools. The boxes come in 5 sizes and 7 different colours. Custom sizes & colours are also available on request. Assembly takes on average 5 minutes – No nuts & bolts, No screws or special tools required. There are only 3 different parts which simply click together in just a few minutes. The enclosures can be assembled by one person with no building experience with illustrated instructions with every order. Industrially engineered to provide enhanced sturdiness yet lighter than other models on the market. Design provides more internal space and easy access. Made from thick (0.9mm) galvanised steel. Ventilation gaps allows for air circulation without any water leaks or compromising noise abatement. Finished with quality thick powder coating. The Acoustic Box is lined with high quality thick sound proofing foam. This generally translates into a reduction of 70 – 80% in noise levels! The reduction is certified by an acoustic engineer report which is readily available. These models are designed primarily for use on the side of the house or in narrow spaces. 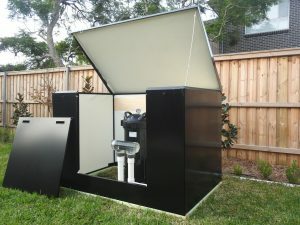 They weigh 50-60kg in total and are design to fit one, filter, pump, chlorinator (and a solar heater for the Large slim). 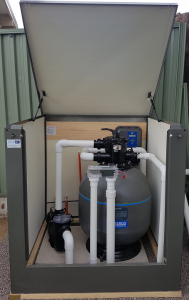 This model weighs approximately 55kg in total and is designed to fit one large filter, pump and chlorinator. 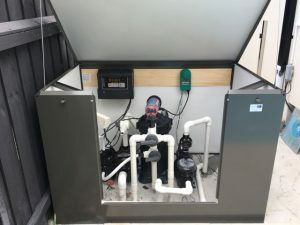 This model weighs approximately 65kg and is designed to fit one large filter, pump and chlorinator plus a solar heating pump. This model weighs approximately 98kg and is designed to fit a large filter and up to four pumps, solar heating, blower etc. Protect your equipment, Children and Pets by enclosing your acid drum in our lockable Acid Feeder enclosure.